Apollonia Pontika Drachm 500 - 400 B.C.E. Around 610 BC, Ionian Greeks from Miletos established an important outpost on the western Black Sea coast. Originally called Antheia, and located on a natural peninsula and three nearby islands, the city quickly became a prosperous trading post by exporting copper, honey, grain, and timber, while importing wine, salt, textiles, and pottery for resale to the inland Thracians. The city’s key trading partners at the time included fellow-commercial centers Miletos, Athens, Lesbos, Chios, and Rhodes.Prosperity soon enabled Antheia to expand and develop as an important cultural metropolis. An important temple to Apollo was constructed within the city in the late 5th century BC. For 500 talents, it commissioned the Greek sculptor Kalamis (of Boeotia) to cast a 13 ton, 10 meter high, bronze statue of Apollo for the new temple (Strabo VII.6.1). So popular was this temple of Apollo, that the city was now renamed Apollonia in its honor. In 72 BC, during his war against the Thracian Bessi, the proconsul of Macedon, Marcus Terentius Varro Lucullus (cos. 73 BC), sacked the city and had the statue transported to Rome, where it was displayed on the Capitol (Pliny, NH XXXIV.18; Strabo VII.6.1).The 5th and 4th century BC coinage of Apollonia Pontika reflects that city’s origins: commercial wealth and maritime power. 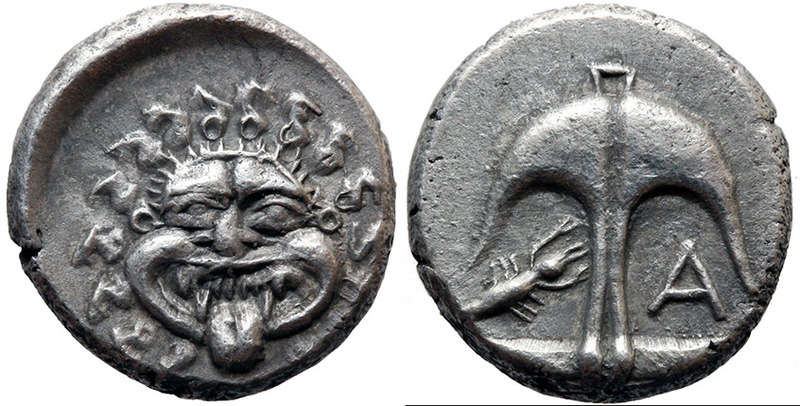 The gorgon was a popular apotropaic device, seen as warding off evil; thus a number of ancient Greek cities adopted it as a coin design. The anchor and the crayfish attest to the city’s reliance on maritime commerce for its economy, and the anchor depicted on these coins is actually one of the first anchors of modern design rendered in Greek art.